Let’s face it, we could all probably do with a bit more simple in our working lives? I’m always struck by how often easy tasks are over complicated by elaborate procedures or unnecessary approval hurdles. Imagine if you had to get the signatures of three managers before you were even allowed to turn on your office computer in the morning? That would be madness. So why do so many businesses include these kind of barriers to something as simple as a purchase requisition? Procurehere offers an e-procurement system with a purchase order approval path that provides a simple solution to what should be a simple challenge. If you want to deliver simple, you have to start with simple. At Procurehere we built our system around making the everyday needs of purchase requisitioning as user-friendly as possible. A purchase requisition(PR) can be quickly raised by a Procurehere user following pre-designed templates. Of course simple also means being able to tweak those requests to fit your processes. Buyer Administrators can access and design their own templates to ensure that the PRs raised can adapt to meet your own changing business requirements. We know it’s not always as simple as a template request though, so you can add on additional documents to your PRs as and when you need it to put all that information together in one place. Once you’ve got that all put together, it’s a simple case of submitting your request for approval. It’s all well and good having a simple template for submission, but unless you get the approval right, your purchase requisition process is still going to suffer. That’s why simple approval processes form the final step in the Procurehere PR system. PRs must pass through a prearranged approval route to make sure that the request you make is quickly seen and easily access by the right approvers. Administrators can preset those approval layers and individuals, providing quick and easy routes for sign off. Approvers can approve or reject a PR by easily accessing and evaluating the information included. But we don’t want to create barriers of communication if those PRs are rejected, so the approvers can also leave comments to make sure the individual who raised the PR knows the reasons behind the rejection. If everything is signed off and good to go, it’s a matter of keying in any comments and clicking ‘approve’ and the approver’s job is done. To make it even simpler, PRs can be handily accessed and approved through our mobile app, meaning you can even approve-on-the-go. Once your PR is raised, approved by all layers and ready to go, the approval journey is complete. A purchase order(PO) is automatically approved, avoiding any additional and unnecessary manual actions, and your approval event is completed. So what kind of difference does all this simple make? 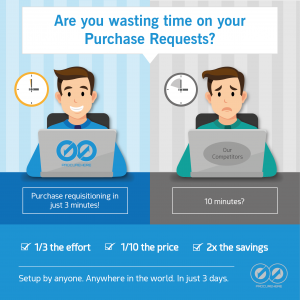 Purchase requests on Procurehere are completed in an average of just 8 hours. That compares to processes that can take days or weeks using alternative approval methods. Simple approval? Simple solution. That’s why Procurehere are always working to keep it simple for your business.